Facial cosmetic surgery is the ‘gold standard’ in correcting these imperfections and dramatically improving the look of the face, with results often lasting years even up to a decade. There are different facial cosmetic procedures which each achieve different results. Surgeries such as brow lift, eyelid surgery, mid face lift or a full face lift can be used individually or in combination, depending on the areas to be targeted and the degree of ageing in the face. Facelift surgery (also known as Meloplasty or Rhytidectomy) involves removing excess skin and fat from the face, tightening muscle, redraping and tightening the skin thus reducing wrinkles, lifting sagging cheeks, and smoothing the jawline and upper neck. 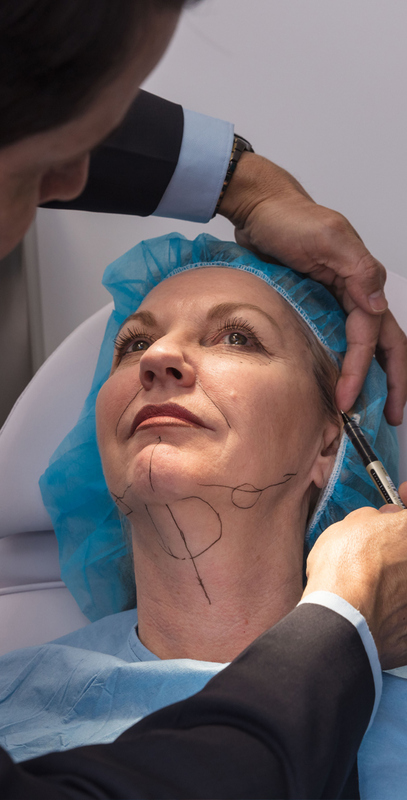 The surgery can also be combined with non-surgical cosmetic treatments, such as skin resurfacing, to treat areas not targeted by facelift surgery, such as fine wrinkles around the eyes or mouth. When performed by a skilled surgeon like as Dr. Verma, facelift surgery helps bring back the youthful contours of the face, giving a fresher and relaxed appearance. Dr. Verma believes in holistic care, including surgical as well as non-surgical methods to give you natural and balanced results most suited to you. What is facelift surgery: Facelift surgery involves removing excess skin and fat from the face, tightening muscle, redraping and tightening the skin thus reducing wrinkles, lifting sagging cheeks, and smoothing the jawline and upper neck. Note, it does not raise sagging eyebrows, remove deep frown lines in the forehead, rejuvenate your eyelids or remove fine wrinkles around the eyes and mouth. In these cases, Dr. Verma may suggest treatments other than a facelift. 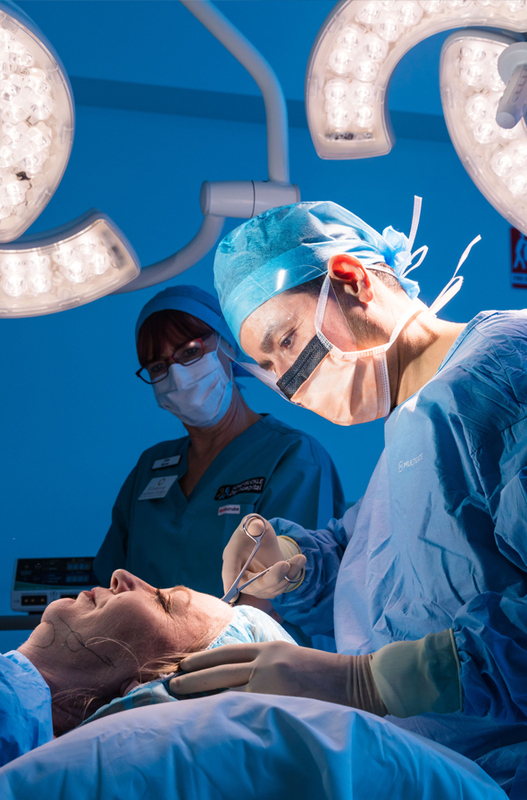 Where is it done: Your facelift surgery will be performed at the brand-new Honeysuckle Day Hospital in Newcastle, a fully licensed and accredited day hospital which specializes in cosmetic surgery. Approximate Cost: Varies according to type, complexity and length of procedure. You will receive a quote with a cost of the procedure after your consultation with Dr. Verma, tailored to you. Not sure if facelift surgery is right for you? Maybe you feel more than one type of cosmetic surgery may be required? Or are you interested in non-surgical ways to create a youthful look? Do I qualify for facelift surgery? A facelift can be performed on people aged in their early 40s to late 70s. Benefits last for longer in younger patients but results are often more dramatic in the older population. You need to be in good general physical and mental health to undergo surgery and ideally be a non-smoker or amenable to quitting pre-operatively. Generally, the consultation is your opportunity to ask Dr. Verma any questions or clear any concerns you may have regarding facelift surgery. What is the cost of facelift surgery. What is included? Cost of facelift surgery depends on the length and complexity of the surgery. After the consultation, once you have decided you are interested in having a facelift, you will receive a quote for the cost of the surgery. This price includes Dr. Verma’s fees (surgeon fees) and the cost of follow up visits up to 3 months post-surgery. It does not include hospital and anesthetist costs but an estimate of such costs can be provided on request. How is facelift surgery performed? Are there different techniques? There are three main types of facelift that can be performed. Dr. Verma has the expertise to perform any of these. The traditional and most commonly performed facelift is a ‘SMAS lift’. In this facelift technique, the SMAS layer is tightened and overlying skin repositioned. The SMAS facelift tightens the jowls, elevating the neck and cheeks to a more youthful position. The second method is Deep-Plane facelift which corrects sagging of the midface, an area not well addressed by other facelifts. It is called deep plane as it involves repositioning layers deeper than the SMAS lift. Deep-plane facelifts generally heal better and effects last longer. Thread or Suture Lift: Thread-lift is the least invasive approach to a facelift where fine suture threads inserted into the skin are used to lift sagging skin. The effects are subtler and less long-lasting compared to other face lifts, but results in the absence of visible scars and reduced down time. It is best suited for younger and middle-aged patients whose skin tissues have sagged with time or sun damage, and wish to avoid invasive surgery. The incisions for facelift are placed in or near the hairline at the sides of the face and around the ears. These generally fade to form faint white scars, although the degree of fading varies depending on how your skin tends to heal and form scars. What are the side effects of facelift surgery? Temporary bruising and swelling, numbness in areas of the face, a tight feeling in the face and dry skin are normal in facelift patients. The majority of such symptoms resolve within 2-3 weeks after the operation. Nerves take longer to recover and numbness can last up to 3 months. In rare cases, it may be permanent. What are the risks and complications of facelift surgery? General risks of any surgery include excessive bleeding, reaction to any of the medications (including anesthesia), infection, poor healing or excessive scarring. 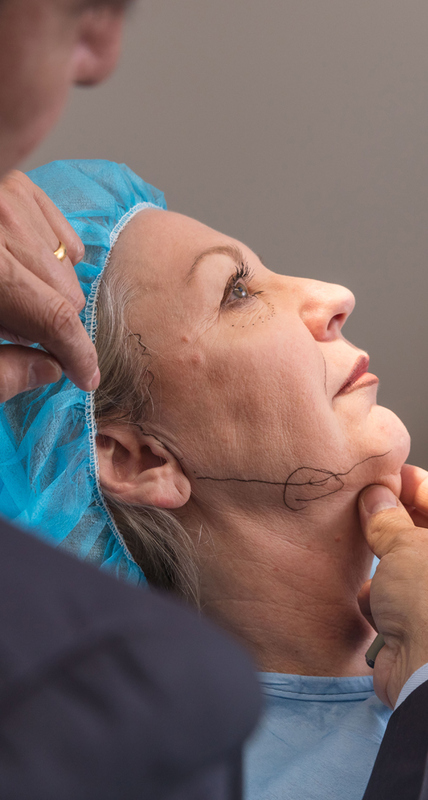 There are also risks and complications specific to facelift surgery such as injury to the nerves that control facial muscles or sensation, or changes to the hairline. Sometimes a thin plastic tube may need to be inserted into the area that has been operated on. These tubes drain any blood and secretions that accumulate under the skin after surgery and help to promote healing. 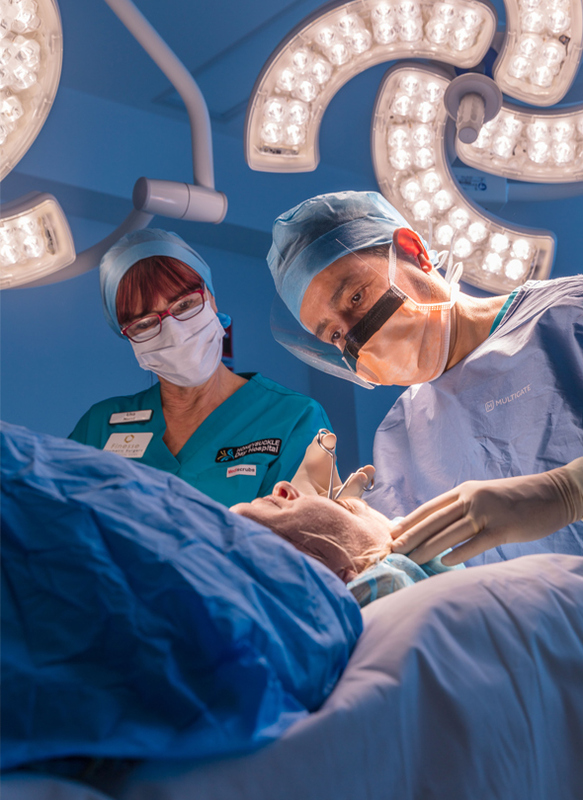 Whether these drains are inserted or not is decided on a case-by-case basis, but generally, they are reserved for those requiring extensive surgery. The occurrence of such complications depends mainly on whether you smoke, your general health status, how your body heals, as well as your post-operative recovery. Dr. Verma will discuss all risks and complications with you during the consultation, as well as techniques and medications which can minimize risks. You will be provided with detailed instructions by Finesse Cosmetic Surgery with regards to care of your sutures, wounds etc. Any sutures are usually removed in 7-10 days. After facelift surgery, you will need to wear a ‘post-op garment’. This is a snug fabric mask for your face to be worn after surgery. It reduces swelling and bruising after surgery, helping to minimize pain and achieve better-looking results. Returning to work takes 14 days, depending on the type of work you do. More strenuous activity (such as lifting, straining, pushing, exercise beyond a light walk) should be strictly avoided for 4-6 weeks. Bruising may take two weeks to resolve. The majority of swelling can take up to a month or more to resolve. Feelings of tightness and numbness in the face are normal after facelift surgery and may last several weeks. Results will be visible after your tissues heal when swelling and bruising subside which may take up to a month or more. Thus, being patient and optimistic is key to recovery after facelift surgery. How long do the effects of Facelift last for? The facelift turns the clock back by 5 to 10 years. This effect fades with time and advancing age and a revision are usually required after 10 years. This still makes facelift surgery the longest lasting treatment for skin ageing compared to other non-surgical alternatives.